PRC released the 12,103 Elementary teachers passers out of 44,144 examinees (27.42%) percent of all takers of the Licensure Examination for Teachers (L.E.T.) given last March 29, 2015. According to PRC, Licensure Examination for Teachers (L.E.T) in Elementary level last August 17, 2014 has 25,301 passers out of 70,786 total of examinees, its only 35.74(%) percent of all successful passers of the said exam. The Board of the Professional Teachers Chairman is none other than Dr. Rosita L. Navarro with Dr. Paz I. Lucido, as Vice Chairman; Dr. Paraluman R. Giron and Dr. Nora M. Uy, Members. We expected the official results to be released on May 29, 2015, as it is the exact 45 days of standard releasing count of PRC. For more information about the LET Results (March 2015) - Elementary Level, please kindly share to your joined social networking sites. 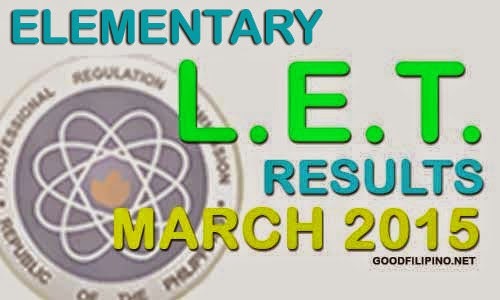 Comments or suggestions about "L.E.T Results 2015 | March 2015 Elementary (Alphabetical) LET Results: A – B – C – D" is important to us, you may share it by using the comment box below.